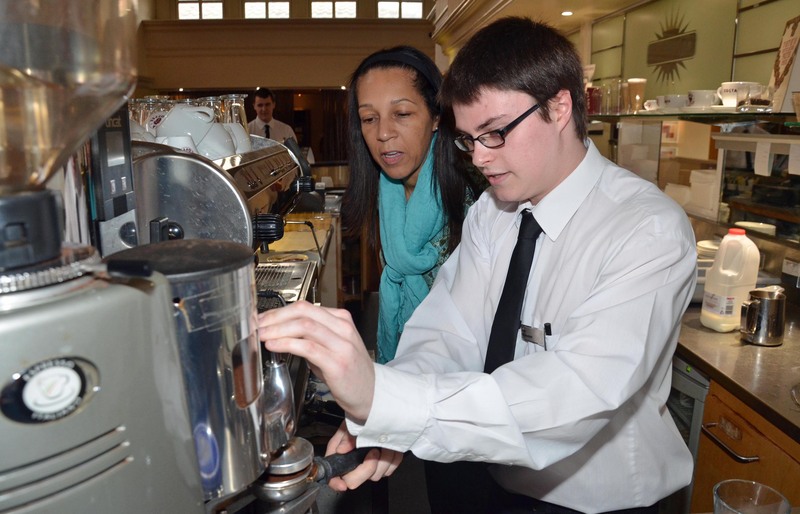 Tourism minister Helen Grant discovered the secrets behind making a wide range of coffees and running a busy reception desk when she joined three apprentices at Hilton Maidstone as part of English Tourism Week. Mrs Grant, MP for Maidstone and The Weald, was welcomed to Hilton Maidstone on Friday (April 4) by hotel general manager Leonardo Gagliano. 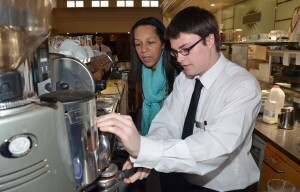 She quickly set to work perfecting her technical and customer service skills with food and beverage assistants George Austin and Adam Morgan, and hotel receptionist Kerry-Anne Wright. And Mrs Grant was undaunted when she discovered one of her first customers was Sandra Matthews-Marsh, Tourism Society chairman and chief executive of Visit Kent – the county’s tourism champions. Mrs Matthews-Marsh said: “In Kent, tourism supports 64,400 jobs and contributes £3.4 billion to the county economy each year. “It is an industry with an open door for hardworking people keen to learn new skills and step onto the career ladder – whether they are school or college leavers, career changers or people who require part-time or non-standard working hours. Mr Gagliano is an active supporter of Visit Kent and has worked with the destination management organisation to develop programmes to raise customer service standards across all areas of the sector. Team members at Hilton Maidstone were among the first to undertake Visit Kent online training – an internet-based challenge designed to raise participants’ knowledge of the county as well as showcasing customer service best practice. Mr Gagliano said: “Our apprentices at Hilton Maidstone are conducting a year-long apprenticeship as part of the Hilton Worldwide National Apprenticeship Academy. The programme has already seen more than 200 apprentices placed in 62 locations across the UK and is one of the many ways Hilton Worldwide is helping young people acquire the life skills and job training they need to be successful in the workplace and beyond. Mrs Grant’s visit to Hilton Maidstone was her second English Tourism Week event in the county. On Friday, March 28, she marked the start of the national event by launching the Kent Big Weekend – a countywide celebration of the tourism, leisure and hospitality industry which sees scores of top visitor attractions offering thousands of free tickets to local residents to explore destinations on their doorstep.